Jess Rheinheimer (Manheim, Pa. / Lancaster Mennonite) tallied her second double-double of the season, scoring ten points and ten rebounds with two blocks in EMU's 76-56 win over Emory & Henry College. The EMU women’s basketball team shot better from beyond the arc than they did from the field and used their 11 3-pointers en route to a 76-56 victory over the Emory & Henry Wasps Saturday afternoon at Yoder Arena. In the Old Dominion Athletic Conference (ODAC) opener for both teams, EMU moved to 4-1 on the season and 1-0 in the ODAC while Emory & Henry dropped to 2-4 on the season and 0-1 in the ODAC. The Royals shot 55% from the 3-point line and were led from downtown by Myneshia Walker (Freeman, Va. / Brunswick)and Sa’Mone Moore (Covington, Va. / Covington), who each made four treys. Alisa Brown (Dumfries, Va. / Forest Park) was a perfect 3-3 from beyond the arc, helping the Royals shoot 53.8% on all field goals in the game. Jess Rheinheimer (Manheim, Pa. / Lancaster Mennonite) tallied her second double-double of the season, scoring ten points and ten rebounds. Defensively, she also blocked two shots in the game. The Wasp’s Karina Farr led all scorers with 18 points and also added ten rebounds. Emory & Henry shot close to 35 percent from the field. The two teams were tied at 13 with 12:32 to go in the first half. But the Royals would go on a 21-7 run over the next eight minutes to go up 34-20 with four minutes to go in the half. The Royals led 42-26 at halftime and would never allow the Wasps within 14 for the rest of the game. 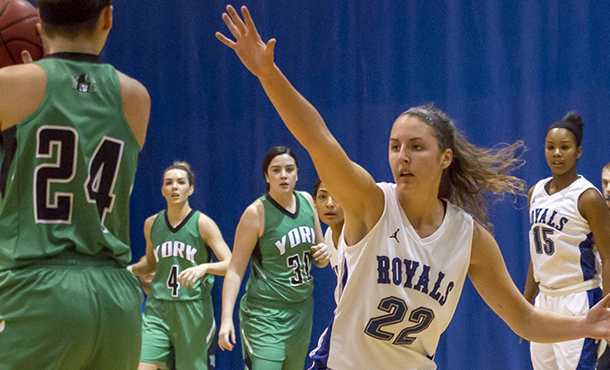 The Royals now head to Randolph-Macon for a 7 p.m. tilt on Tuesday, December 2.